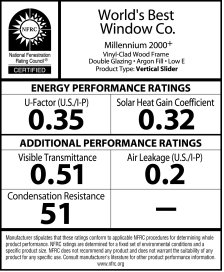 The National Fenestration Rating Council (NFRC) energy performance label allows you to compare one window with another in terms of resisting heat buildup in summer, warming your house in winter, keeping out wind, and resisting condensation. You can learn more about windows, passive solar and photovoltaic panels in Toward A Zero Energy Home. You can also download Chapter 1 – The Building Envelope for free. Read it and pass it on. The solar heat gain coefficient (SHGC) measures how well glass blocks heat in sunlight. The SHGC is the fraction of solar radiation admitted through a window (both directly transmitted and absorbed) and released inward or how much heat gain is blocked by the window. SHGC is expressed as a number between 0 and 1. The lower a window’s solar heat gain coefficient, the less solar heat it transmits in the house. The lower the number, the better for east and west windows; the higher the number, the better for south windows. Visible transmittance (VT) measures how much light comes through a window. VT is expressed as a number between 0 and 1. The higher the VT, the more visible light is transmitted. Note: If retrofitting windows on the same side of a house with existing windows with a different VT number, they will will look different from both inside and outside. Air Leakage (AL) is indicated by an air leakage rating expressed as the equivalent cubic feet of air passing through a square foot of window area (cfm/sq. ft). Heat loss and gain occur by infiltration through cracks in the window assembly. The lower the AL , the less air will pass through the cracks in the window assembly. This number is important to the airtightness of the building. Condensation Resistance (CR) measures the ability of a window to resist the formation of condensation on the interior surface. The higher the CR rating, the better the window is at resisting condensation formation. Although this rating cannot predict condensation, it can provide a credible method of comparing the potential of various windows for condensation formation. CR is expressed as a number between 0 and 100. Each surface glazing raises the CR of the window. Super-windows have a very high CR.